This map provides another way of visualizing population density, but this time with a layer of political consequence. 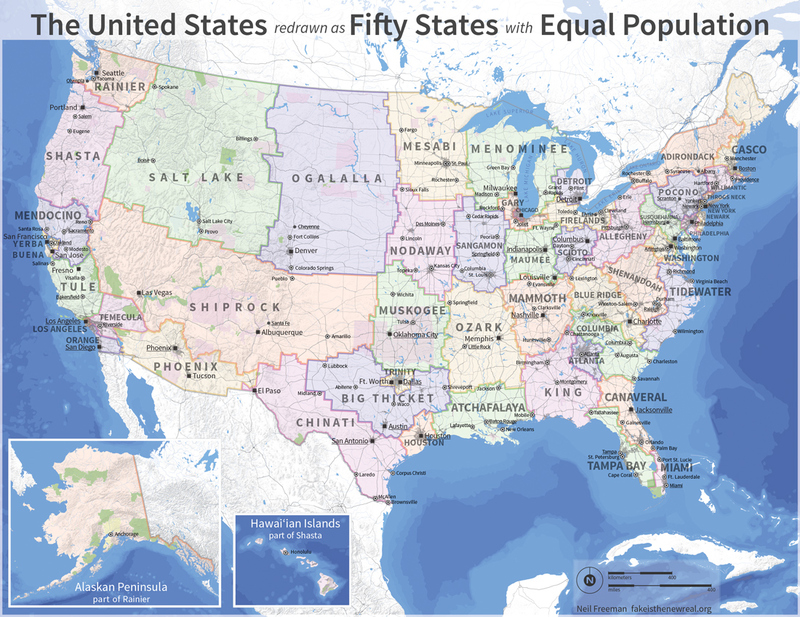 Each of the states is centered around one of the 50 largest cities. Freeman’s algorithm then used proximity, urban area, and commuting patterns to further group counties around these cities. After this initial modeling was completed, he manually adjusted the map to account for a variety of other factors, such as compact shapes and equal populations. Freeman notes that this map has the advantage of ending disproportionate representation in the House and Senate and suggests that states, much like House and Senate districts, could be redistricted after each census to reflect changing population patterns. While Freeman is careful to note that this is “not a serious proposal,” I enjoyed this visualization because it challenges the idea of states as fixed geographical/political entities, while still providing meaningful groupings.